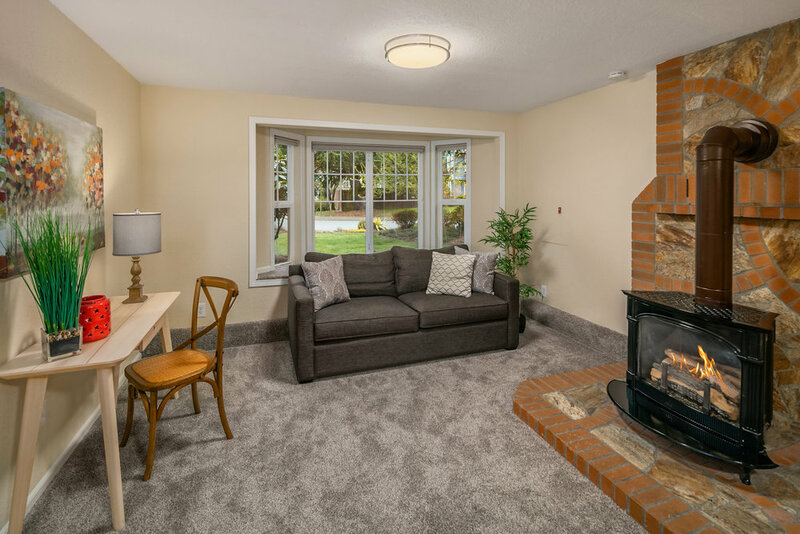 Beautiful light-filled spaces invite one to relax next to the fireplace or play a board game nearby. 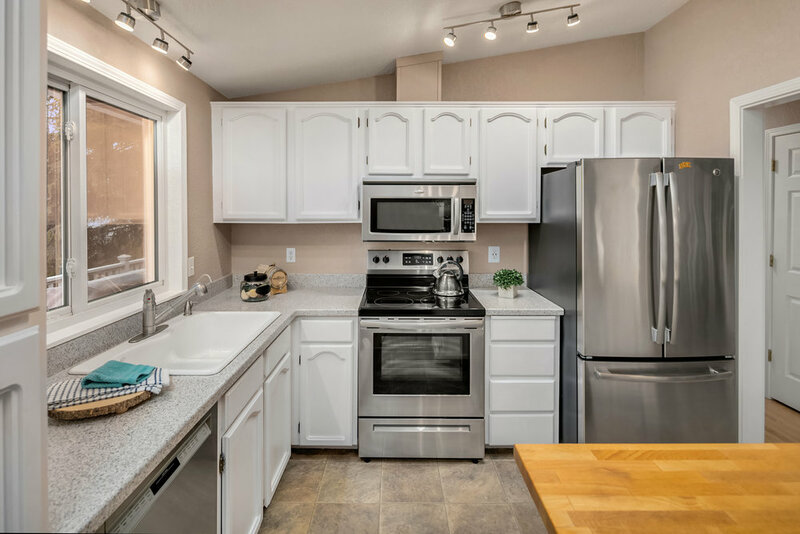 Vaulted ceilings give a sense of spaciousness in perfectly designed, warm and cozy family home offering 3 bedrooms and 2 bathrooms on the upper level, and a 4th bedroom (or office) downstairs with a full bath. 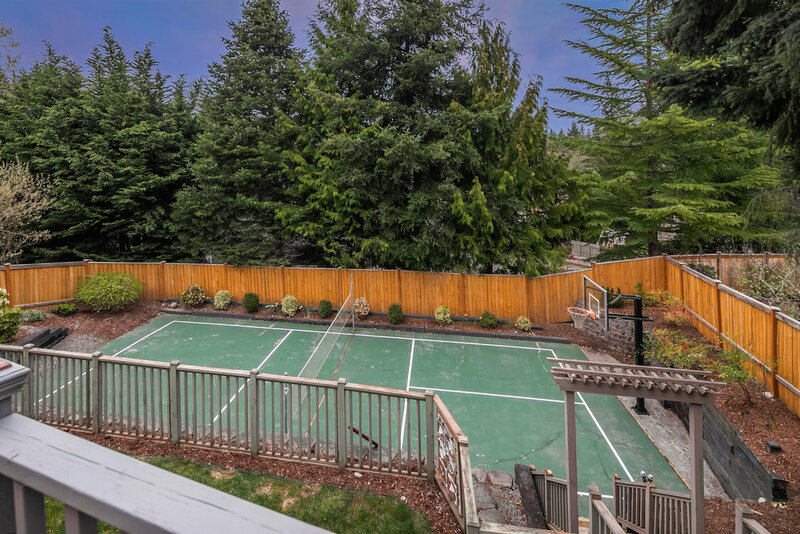 An expansive sports court, landscaped and ready for a game of pickleball! Curl up next to the custom designed mosaic fireplace with a glass of wine and unwind at the end of the day. The fully landscaped and fenced backyard offers a sports court and patio waiting for the grill. 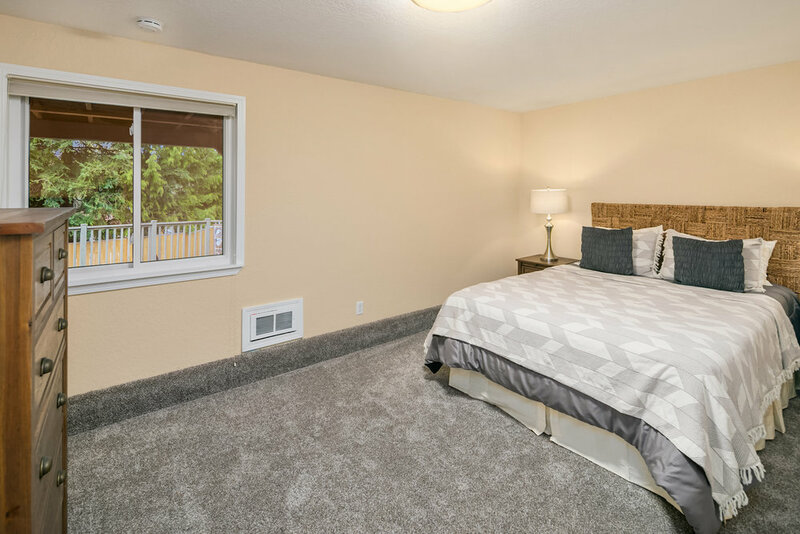 Located near highly desired Lake Washington Schools; walkable to Margaret Mead Elementary and E Sammamish Park. Close-by to Metropolitan Market, Trader Joes, Teen Center and the Sammamish Library. The spring selling season is officially in full swing, and I’ve been loving partnering with my clients to help them set and achieve their real estate goals. 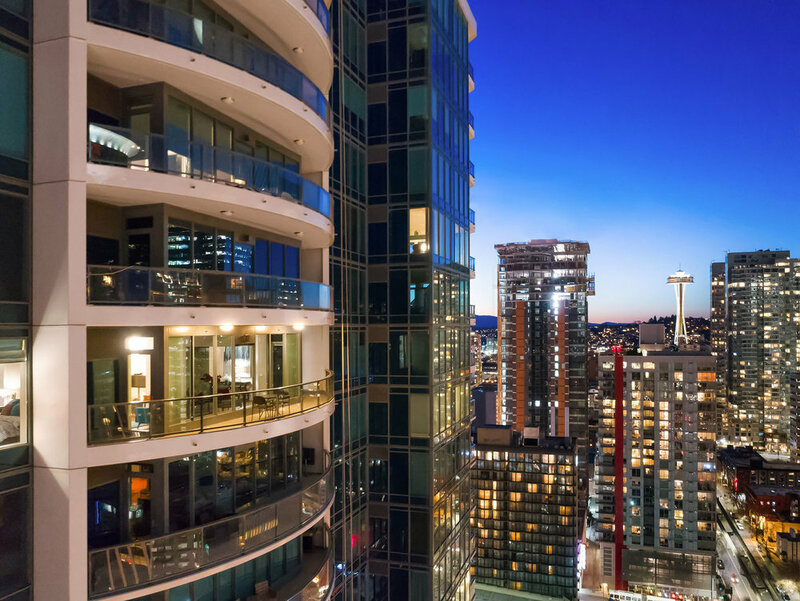 Most recently, I listed a fabulous condominium in downtown Seattle’s Escala building, my Luxurious Lakefront Estate listing in Federal Way went pending, and I helped two buyers negotiate their way into their dream homes. A luxurious in-city lifestyle comes together at Escala, where glistening views of Seattle meet artistry and meticulous attention to detail. From the moment you enter the building an overwhelming sense of comfort and ease washes over you, as a grand staircase and spectacular Chihuly chandelier give way to your private elevator lobby. Unit 2505 offers two en-suite masters, gorgeous Brazilian hardwood floors, a dual sided gas fireplace, and an open kitchen with modern Pedini cabinets and Gaggenau appliances. 25 floors up and a world away! Situated upon 2.3 acres, ornate French doors open to vast bright spaces of tasteful design within this Custom Luxury Lakefront Estate. 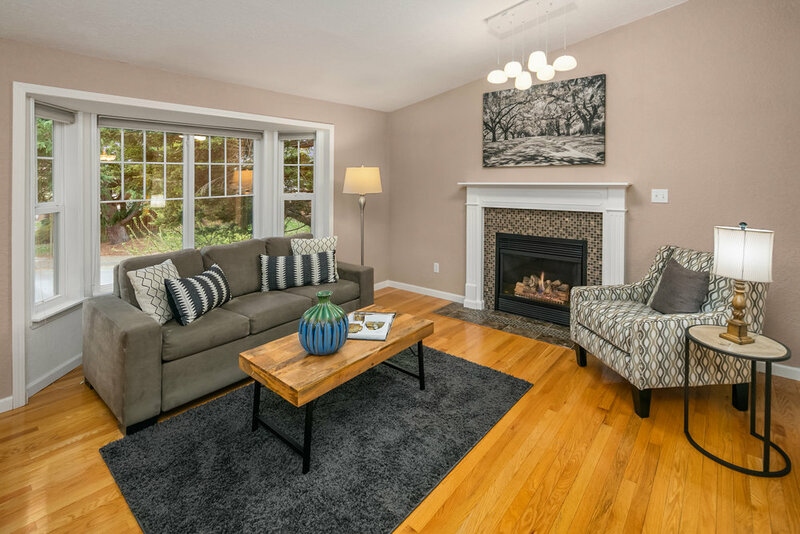 I was thrilled to work together with my sellers to properly position this home on the market, utilizing custom print materials and tailored marketing to make its stellar details shine and align it with a qualified buyer. I recently helped a client secure this wonderful home in the Lexington, which stood out for its grand entrance, designed features, and spacious floor plan. I also worked with a treasured client in Port Orchard who wanted to embrace the waterfront lifestyle with views of delightful sunsets, city lights and the occasional whale. Thinking about making your next move in 2018? Contact me today to schedule a complimentary appointment to discuss your options. Homebuyers can expect more of the same in Seattle this year, as inventory will continue to decline while prices are expected to continue their rise across the region. As King 5 News reports, there will be just over 20% fewer homes available for sale in 2018 than there were this past year, part of an inventory shortage now being described as “approaching crisis levels” among the nation’s hottest markets. Given the increased demand and lack of availability, it’s not much of a surprise that in 2017, 52.4% of homes sold above their asking price, as Emerald City home prices grew 12.5%, nearly double the nation’s 6.5% average. A recent article published by Seattle Times shed light on just how much home values are rising, as they report that 1 in every 5 or 6 homes that sold in King County in 2017 reached 7 figures, a 71% increase compared to 2016 numbers. For additional information regarding market fundamentals, explore the Northwest Multiple Listing Service Year-End Report or schedule a complimentary appointment with me to discuss your real estate goals. SRES: Senior Real Estate Specialist is a National Association of Realtors designation awarded to those completing coursework and testing for specialization in working with SENIORS, or those age 50+. I have to admit the coursework did little to help me be proficient in understanding all of the housing opportunities available to seniors here in Washington. As a result I have been on my own mission in gathering information which I hope to assemble in an understandable format to offer seniors in their quest for learning and selecting housing most suitable for their circumstances. From assisted living facilities, to retirement communities, SHAG housing to Class A facilities, I hope to be more resourceful in these areas soon, due in large part to demand. For now all I can only say is Stay Tuned (or if you have needs now - contact me and we can learn together). Curbed has recently featured the stunning Lois Jane Hastings home which is listed by Realogics Sotheby’s International Realty broker Pamela Bellah. 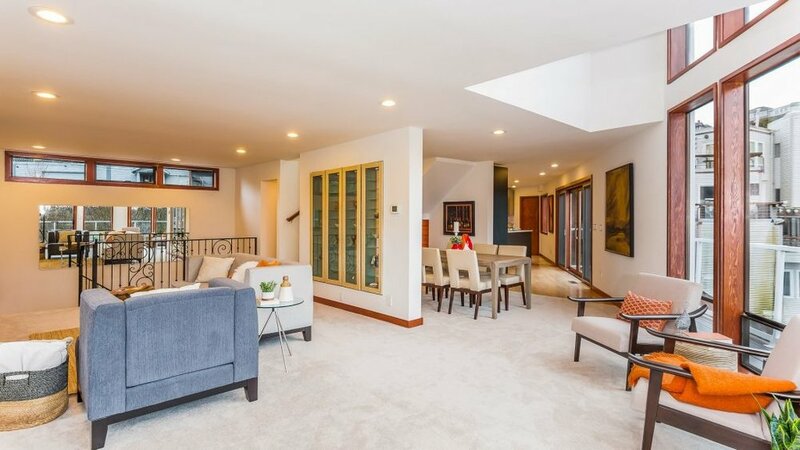 This chic and contemporary home has stunning views of the Seattle Skyline and Puget Sound which can be enjoyed from many of the rooms as well as two of the decks. There are many unique features within this home, including a custom kitchen that was shipped in from Harrod’s in London and the excellent design by notable architect L. Jane Hasting. Hastings, who started as the only woman in her University Of Washington architecture class in 1949, went on to become the eighth woman to be licensed as an architect in Washington State and the first woman president of the Seattle Chapter of the American Institute of Architectures. I am excited to share that I was chosen as a featured broker for Top Agent Magazine! I am excited to share that my luxury townhome in North Beacon Hill won "Home of the Week" on the Puget Sound Business Journal! THANK YOU to all of you who voted for my property. Home of the Day is a feature presented by the Puget Sound Business Journal and Realogics Sotheby’s International Realty. 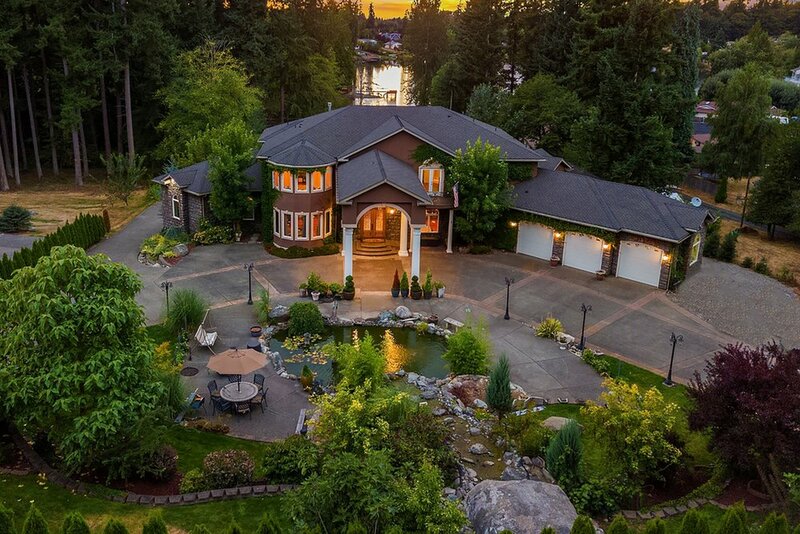 This is your invitation to view some of Puget Sound’s most luxurious properties. Exceptional quality & design adorn this spectacularly light-filled luxury end-unit townhome built in the midst of red hot N. Beacon. A commuter’s paradise, walkable to light rail, & the Metro bus hub offering access/transportation to almost everywhere! 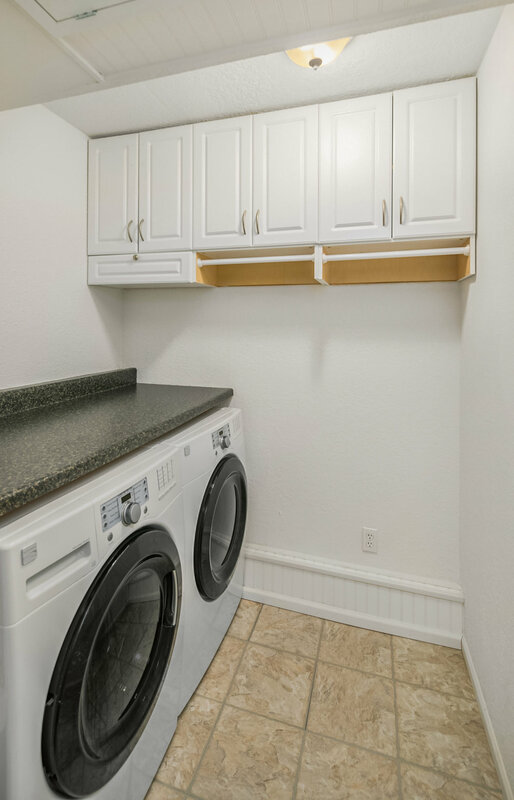 Rarely offered 2 Car off-street parking (1 garage/1 space in front of garage), plus all the interior features for the most discerning buyers: quartz countertops, SS, bamboo floors, hydroponic heat, tankless H2O, 4 Star Built Green. The couple enjoyed owning and operating the inn for years, as Kathy Michael told the Kitsap Sun, “we very much enjoyed doing it. Saving a historic site was very much rooted in both of us. It benefits the town and vice versa.” But after Gil’s death last year, Kathy is ready to move on to her next adventure and give another lucky owner the opportunity to own this wonderful historic property. The home certainly does stun, from modern amenities including radiant heated floors to quiet places of solitude perfect for curling up with a novel or watching the sunset. The study found that Seattle has a GMP of $75,874 per resident (a growth of 7.9% since 2009), which puts it above Boston at $74,746 and Washington D.C. at $72,191. The Seattle PI recently profiled real estate in Seattle’s popular Wallingford neighborhood, choosing to include Classic Craftsman Bungalow, listed by Realogics Sotheby’s International Realty broker Pamela Bellah, on the front cover of the feature. October’s numbers are in and inventory continues to wane for King County Residential homes, down 15% compared to last month and 40% year over year. The median listing price was just under $530K, with an average sale price of $427K, up nearly $40K compared to the previous year. Buyers came out strong, as homes were on the market for an average of just 28 days, down 30% from last year’s numbers. In downtown Seattle, condo inventory was down 15% from the previous year but rose slightly compared to last month. The median sale price held steady from month to month but was up $35K from last year’s average. 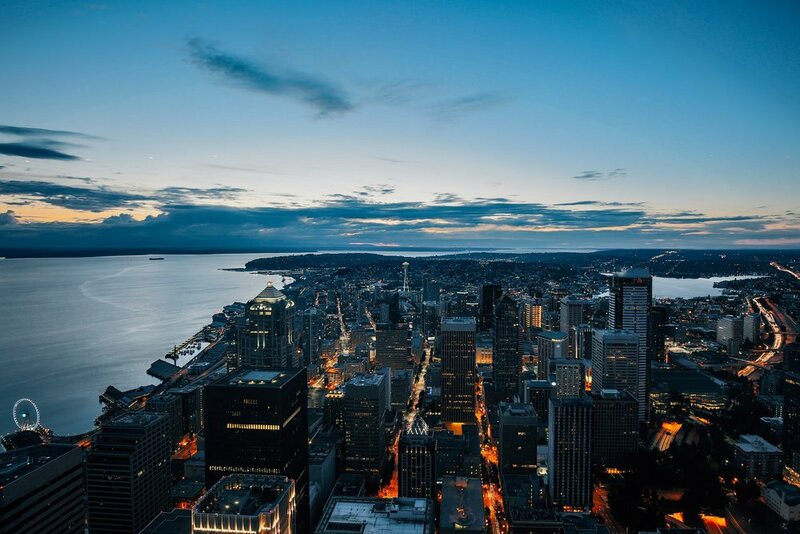 Whether you are new to the region, planning on visiting soon or a seasoned Northwesterner, be sure to check out Realogics Sotheby’s International Realty’s TOP 20 Things to do around the Pacific Northwest for some ideas on what to do when you are here! According to recent Census data, California sends more new residents to King County than any other state in the US, as noted in a recent Seattle Times article. The trend makes a lot of sense considering that the two states share a time zone, a love for the ocean and a propensity for employing high-tech workers, as recently highlighted by The Wall Street Journal and the Puget Sound Business Journal, which described that the average home costs nearly $600,000 less in Seattle compared to Silicon Valley. A delegation of RSIR brokers and owners recently visited the Bay Area to explore these trends firsthand. Jones says one of the trends is for affluent Californians to buy a principal residence in Washington State and keep their current home in California as a second home. 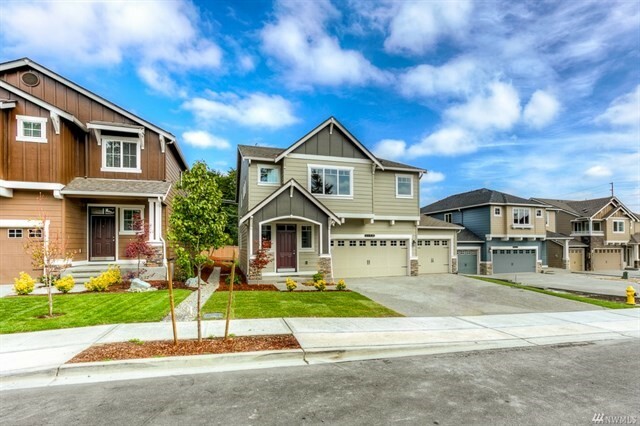 By becoming a Washington resident and living in the Puget Sound region for the majority of the year, passive income earners can avoid paying state income tax in California and invest those savings in building equity in two homes instead of paying the government. Californians remain a targeted consumer group for RSIR, as have immigrating Asian home buyers, who comprise the second largest relocating demographic in Washington. In an effort to expand homeownership among lower-income buyers, President Barack Obama cut mortgage-insurance premiums charged by the Federal Housing Administration (FHA) in an announcement according to Bloomberg News. Lashley breaks down the changes like this. Mortgage insurance on a $400,000 loan currently costs a homeowner $450 per month but will drop down to $283 per month under the reduced premium providing a $166 per month savings to homeowners financed through FHA. Under the new premium structure FHA estimates that 250,000 additional first-time homebuyers will be able to enter the market due to the reduce premium and over 2 million borrowers will save an average of $900 annually over the next three years if they purchase or refinance homes. 2015 is quickly shaping up to be a blockbuster year in real estate according to Lashley. He says homebuyers can take advantage of incredibly low interest rates, less restrictive FHA underwriting guidelines and now lower mortgage insurance to leverage their purchasing power all at the same time. He also warns that an increase of more homebuyers could make the marketplace even more competitive for buyers. These favorable factors coupled with fast rising rents are not lost on first time homebuyers as Millennials and other modest income buyers are projected to move into the home buying market in record numbers this year. Other macro factors such as increased employment, low inflation and low relative home prices are further enticements for new home buyers to act in the first quarter of the New Year. Anticipating a return of consumers favoring ownership over rental, some developers that rented their remaining condominium inventory are returning them for sale. Such is the case at Carbon 56 in downtown Seattle in the popular South Lake Union neighborhood. Broker Carrie DeBuys with Realogics Sotheby’s International Realty says remaining homes are priced from $377,500 to $529,500 and monthly payments can look a lot like rent. The year 2014 was one of tremendous growth for RSIR and for many of our top producing brokers. In total our real estate professionals generated 794 transaction sides totaling in excess of $580 million in gross sales volume, as compared to 494 transactions grossing $330 million in 2013. That’s an increase of about 60-percent. Roughly half of our sales were as the listing broker and the balance were representing buyers on other listings. Interestingly, RSIR brokers were on both sides of 13-percent of these transactions. The average selling price in 2014 was $730,000, which is on average twice the value of the remaining top ten top producing real estate brands in the region. 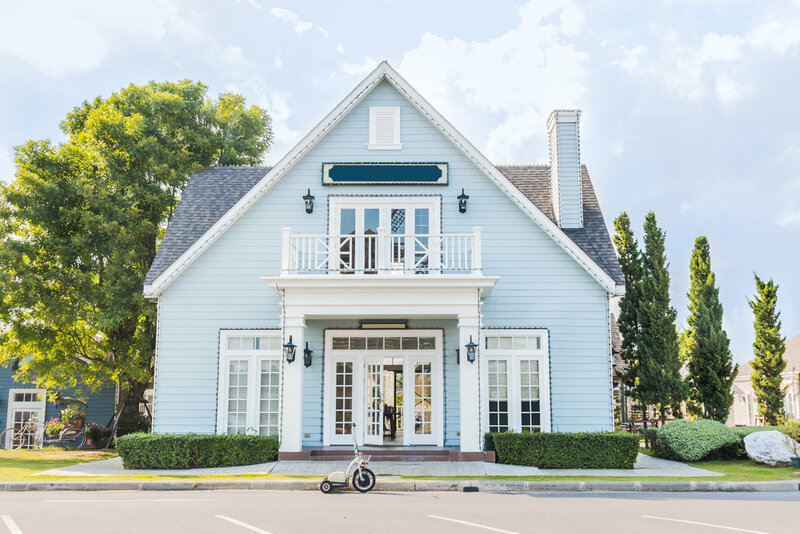 The firm also increased referral revenues by 70-percent demonstrating traction with other Sotheby’s International Realty affiliates in other interstate and international markets. In comparison to our peers, RSIR is consistently growing faster, has a higher number of producing brokers and the highest average listing and selling prices. While RSIR is perhaps best known for representing extraordinary properties and lifestyles, our price point distribution reveals that 46-percent of these sales were actually below $500,000 while 34-percent of our sales were between $500,000 and $1 million and 20-percent were valued over $1 million. Our broker count has increased from 69 licensed real estate professionals at the end of 2013 to 120 by year end 2014. That’s an increase of 58-percent. In addition to opening our flagship Eastside office in downtown Kirkland, we also opened a second Gallery Branch Office on Bainbridge Island in 2014. In early 2015, RSIR will also open in Issaquah. Congratulations to all RSIR brokers, employees and executives for a phenomenal year of growth. Happy New Year! Realogics Sotheby’s International Realty, the Pacific Northwest’s largest affiliate for the global real estate network, announced today its collaboration with The Puget Sound Business Journal (PSBJ) in the launch of an interactive voting tool on their exclusive “Home of the Day” platform. 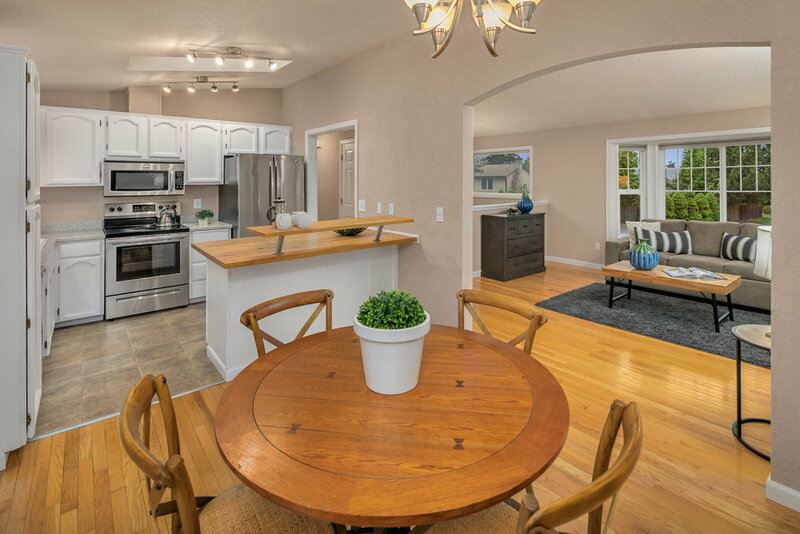 The media partnership had previously introduced “Home of the Day” on PSBJ’s multi-media website and as part of the popular afternoon newsletter that reaches nearly 20,000 subscribers. Now users are able to activate a dynamic voting component where they can register their preferences for the “Home of the Week”, which will be further promoted online and in print within the weekly newspaper. 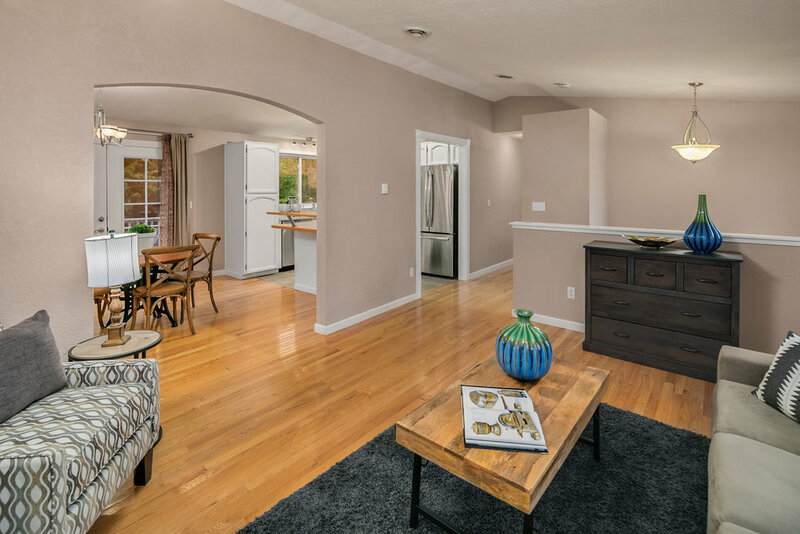 The updated “Home of the Day” feature is now live. The Journal reports impressive statistics for the platform. Since launching on September 1, 2014, over 656,000 photos have been viewed from 44 property galleries. “Home of the Day” has risen in popularity each month, going from 4.26% of PBSJ’s website traffic to accounting for 7.76% in early November. The voting tool will allow consumers to submit votes for the properties they prefer, similar to a “Like” on Facebook. The total votes each week will be tallied and the most popular listing will be identified as the “Home of the Week” on the platform as well as published as the winner in the PSBJ’s print edition the following Friday. Likewise, each weekly honoree will compete for “Home of the Month” and even “Home of the Year”. All listings will remain active on the website portal for a minimum of 30 days and the vote counter will track the number of unique votes in real time. The “Home of the Day” platform is currently running in metro areas in several states across the U.S. including California, Georgia, Kentucky, Maryland, Missouri, New York, North Carolina, Pennsylvania, Texas, Oregon and Washington, D.C.
For more information visit www.NWHomeoftheDay.com.